Millboard is all about showcasing wood’s natural grain. Many years were spent developing this natural wood look in a wood-free composite that provides the attractiveness or real timber without the flaws that can come with the real thing. why choose millboard for decking? Millboard composite decking is created by moulding the authentic grain pattern of real timber boards using a polyurethane resin reinforced with mineral fibres and a unique Lastane® surface. Millboard has now been tried and tested over 10 years and will withstand the most challenging environmental conditions without splintering, rotting, warping or fading significantly. It will continue to look inviting for years to come with very minimal maintenance, a simple wash off every now and again will keep Millboard decking looking great. If you are looking for an ultra-low maintenance decking Millboard is the perfect choice for residential or commercial use. 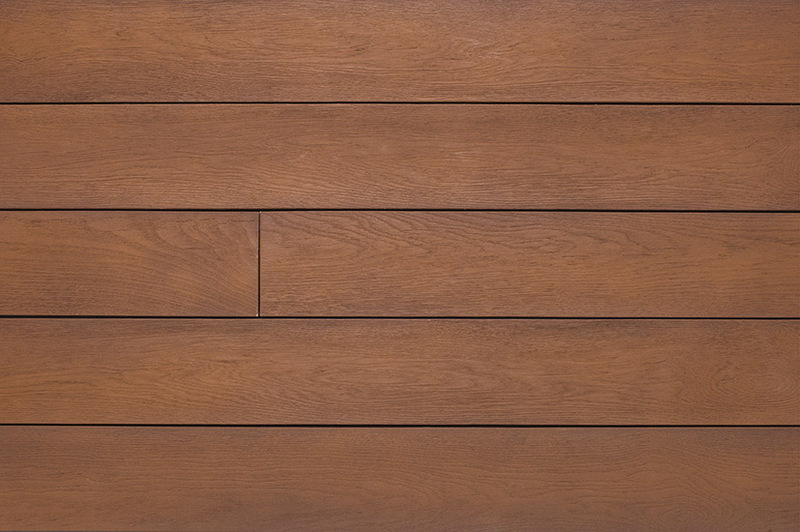 Enhanced Grain showcases a smooth, natural wood grained finish of modern elegance. These boards are 176mm x 32mm, 3.6m long. Weathered Oak replicates 100-year-old wharf timbers, sun-bleached driftwood and old railway sleepers. It has the fine detail and character that usually only comes with real wood. It is perfect for a wide range of landscaping applications. 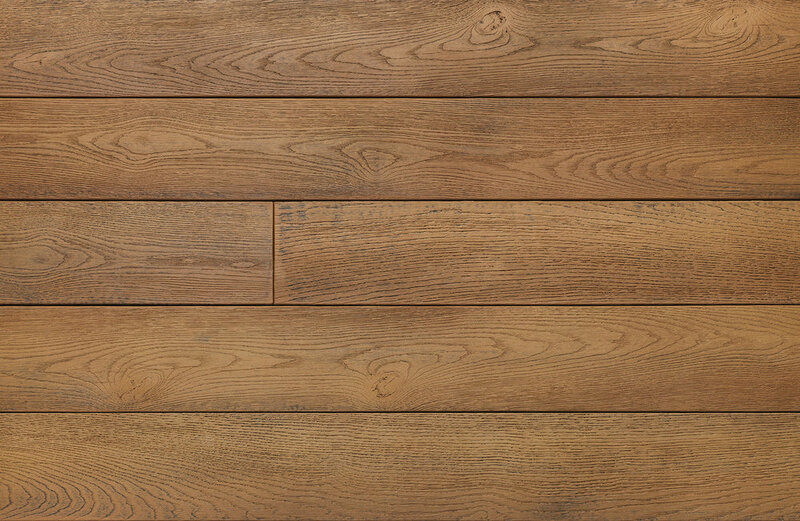 Millboard Weathered Oak board dimensions are 200mm x 32mm, 3.2m long. 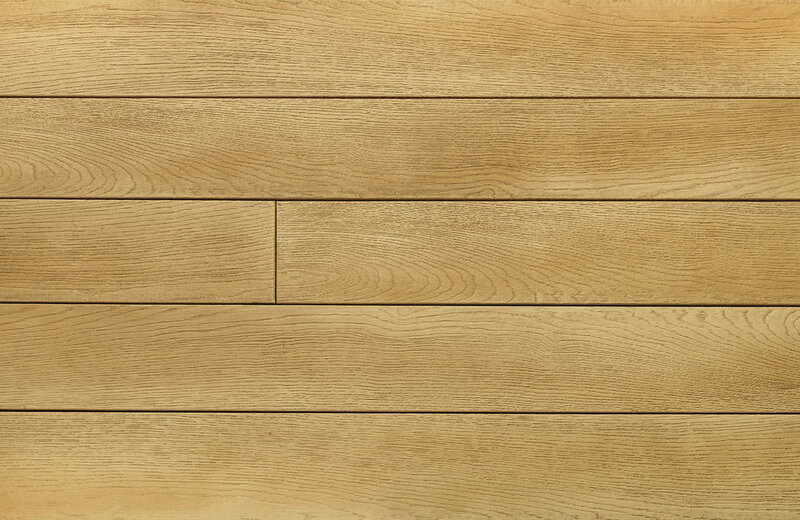 Millboard is as beautiful as hardwood but ingeniously designed to improve timber in all areas. Use Millboard to create the perfect finish to your outdoor area without having to worry about time-consuming regular maintenance. All Millboard products are handmade with care and quality; every board is carefully hand coloured to perfectly re-create that real wood appearance. With Millboard the possibilities are endless; decking, wall cladding, seating, and planter boxes can all be constructed from Millboard. Talk to Austim about your vision and to see if Millboard is right for your project. In a word simple, the Durafix Stainless Steel 316 fixings just screw straight in, no pre-drilling or countersinking needed. Stop the screw head 5mm below the Lastane® surface and it will leave a small, almost indistinguishable hole. Wood free and carbon verified using the least amount of energy and carbon possible - 430g CO2e per square meter. The Lastane® finish is highly resistant to scratches and stains from food and drink spills. Can Millboard be used for other applications? Can you cut the boards as you can with wood? Millboard may be scored with a carbon-topped multi purpose mitre or chop saw. Matching colour coating for exposed ends is available in 500ml tins. As the shaped end of the board disappears when cut, these can be placed in less prominent areas against an edging profile or walls. What are the recommended fixings for millboard? Following considerable trials, we approve and supply self-drilling ‘Durafix’ stainless steel screws. There is no need to drill beforehand or countersink the boards and the inimitable Lastane® material will self-heal leaving no unidentifiable marks for a clean finish. Joist spacing of 400mm is recommended for small-scale commercial and regular residential use. On heavy commercial balconies, bridges, jetties, entrances, and stairs use 300mm spacing. If you need to cut the Millboard down lengthwise the joist centres will need to be adjusted accordingly; at least 3 joists are required for any chopped boards. All decking boards are reinforced for additional strength. For laying 45° to the joist, we recommend max 300mm centres & 240mm for commercial use. How do I finish the edging detail? We recommend that our purpose-made edging is fitted at steps and supported by fascia boards to complement the aesthetic and performance of your deck. Fascia deck boards and edging come in rigid as standard, however, flexible boards and edges are also available and can be curved to follow a maximum convex diameter of 3 metres. Can you recommend a merchant or an installer? We have a network of recommended installers, who are chosen for their professionalism and high-quality workmanship, who can do the work for you. We want you to get the best possible result from your project - ask our team for a recommendation. Does Millboard decking come with a Warranty? Yes, our 25 year residential limited warranty protects you against rotting such as fungal and mildew decay, as well as splitting and twisting, so you can relax in knowing that you’re covered. Millboard products are handcrafted for maximum durability in the UK. Why is Millboard decking virtually maintenance free? Millboard products are manufactured with a non-porous material, therefore resisting algae development and stains. There is no need to use any kind of harsh cleaners, solvents, waxes, chemicals, lubricants or other household cleaners on boards and no need to pressure wash as dirt does not get deep-seated. As the surface texture is non-porous, any dirt and grime may be simply washed off with soapy water and brushed with a soft bristle broom as you would for an indoor area. Are all Millboard decking boards anti-slip? Yes, according to AS4586:2013 slip resistance assessments Millboard is an industry leader, scoring highly in P5 anti-slip ratings even in wet conditions. See the slip test report for yourself - download Millboard slip test report. As with all flooring, it is best to buy all you need in one go, as different batches may have slight variations. Otherwise, we recommend blending different batches. 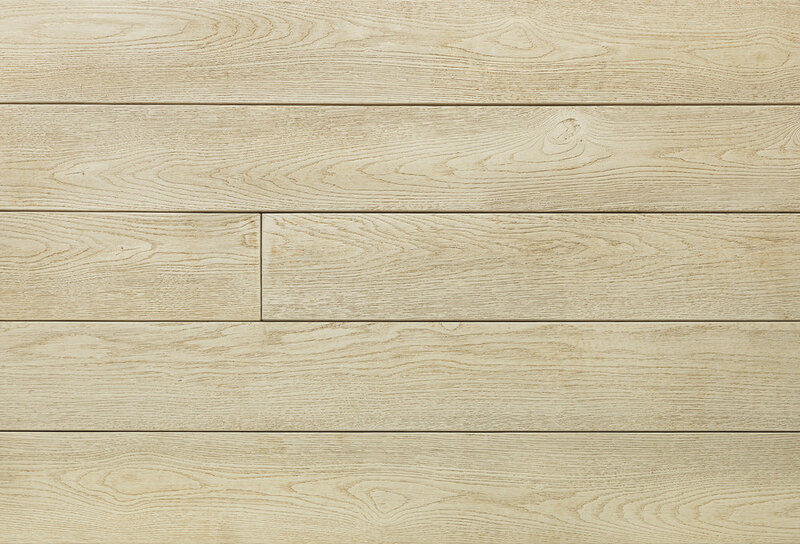 Contact Austim to discuss in detail about millboard and get a FREE quote. Austim has the best composite decking timber supplies Perth wide and makes choosing the right product easy. 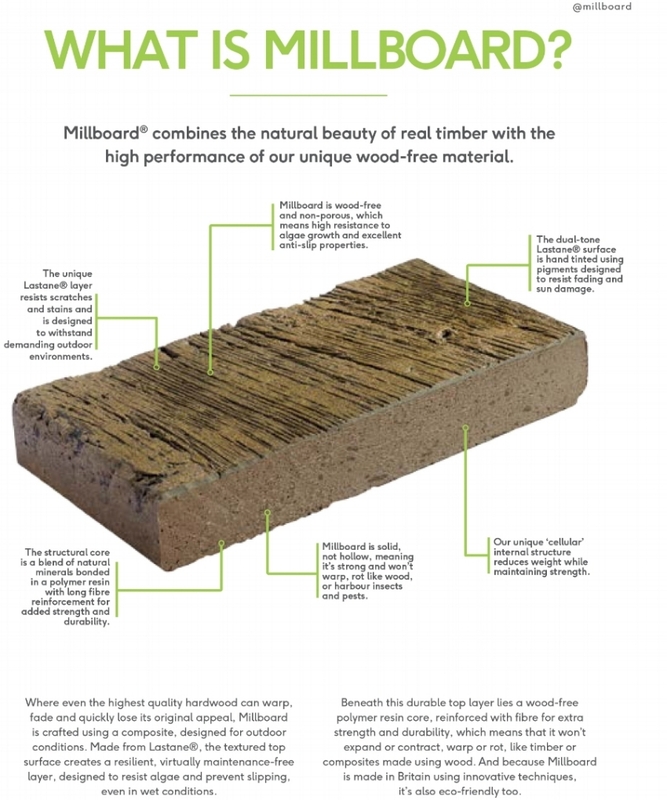 Got questions about Millboard? Ask Austim!